My career has hit a roadblock. The director who was going to produce my play has yet to come up with the money, and communication is very shifty/shady. The contract I was given was really restrictive/unfair to my entitlement as the playwright, so much so that I didn’t feel comfortable signing it. My moment of crowning glory was instead met with a logistical nightmare and now I have this horrible feeling in my stomach like I’ve made a terrible mistake by giving these people so much of my time and energy. “Taking my time” is NOT my strong suit. The Hanged Man asks the querent to pause, to take time to figuratively string yourself up and hang out. It’s about the sacrifice of control, of power, of decision. It’s about patience, waiting – strength to know that when we’re ready, we’ll untie ourselves and move forward. A huge emotional release is required when one sees the Hanged Man. I think of yoga, strangely enough, and how yoga teachers will always ask you to release your breath – symbolic of releasing things you’re trying to control. 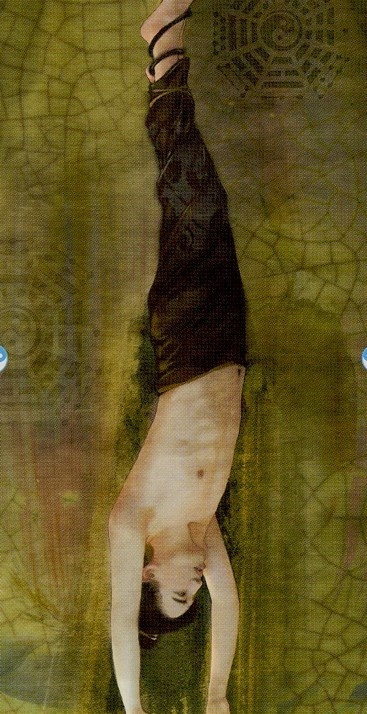 The Hanged Man is a spiritual card – maybe even more spiritual than many other cards, because it very distinctly calls for inaction and reflection. The Hanged Man is sometimes related to martyrdom. Also, in many interpretations, his legs are crossed into a “4” shape to signify stability and tranquility. Martyrs accept their fate. They accept that to hang where they are is the will of the universe, not their own. I’ve been focusing so hard on my own will – on what I want. Maybe it’s time to remind myself that my career (and my life) is a journey. I need to enjoy every minute, not rush out of where I am to get to the next step. I think I need to force myself to take a breather and look deeply at what’s making me so impatient. Then, I need to address it. In the meantime, I think a little mandatory calm-down time is in order. So if you don’t mind, I’m gonna go find some rope. Check out my Hanged Man Pinterest Gallery Here!